Edmund Blackadder:"Now am I by any chance addressing a senior dignitary of the Spanish inquisition?" Edmund Blackadder:"uh good.... because if I am, I wish to make it quite clear that I am prepared to tell you absolutely anything." Lord Percy:"I like you young Bob. You've got balls!" Ludwig:"If you gentleman were to tell me a way to... let us say, gain access to your queen, I might just be able to commute your deaths to a life sentence." Edmund Blackadder:"Are you suggesting we betray her?!!" Melchett:"Black Adder what are you saying?! What of loyalty! Honor! Self respect!" Ludwigh:"So you will both play ball?" Lord Flashheart:"Am I pleased to see you or did I just put a canoe in my pocket?!" Queen Elizabeth:"But how did you know it was him?" Edmund Blackadder:"This was the information with which we bought our lives. We told them that if the Queen was having a party than Nursie always goes as a cow. From that moment he was doomed. All we had to do was escape, return, and kill the cow." Queen Elizabeth:"But how could you be sure it was not Nursie?" Edmund Blackadder:"Because lady, Ludwig was a master of disguise, whereas Nursie is a sad insane old woman with an udder fixation." Edmund Blackadder:"What on earth was I drinking last night?! My head feels like there's a frenchman living in it." Lord Percy:"Welcome Edmund! Did you miss me?" Edmund Blackadder:"I certainly did. Many was the time Percy I said to myself 'I wish Percy was here... being tortured instead of me'." Queen Elizabeth:"Did you miss me Edmund?" 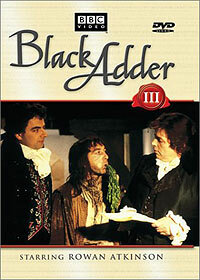 Edmund Blackadder:"Madam... life without you is like a broken pencil." Lord Percy:"I'd like to see the Spaniard who can make his way past me." Edmund Blackadder:"Well go to Spain, there are millions of them." Edmund Blackadder:"Now just wait a minute, if anyone is going to be spoken to around here its gonna be me alright. Tell him Melchett." Edmund Blackadder:"Ah that's better... Now what's he saying?"